Christmas is the most significant festival of the Christians. It is also known as Xmas. It is observed with great pomp and shows by all Christians. It is celebrated on the 25th of December every year. It was a day of great cold when Mother Mary gave birth to a divine child, who was late on known as Jesus Christ, the founder of Christians. When Jesus was born, people were full of beliefs. They were divided into small groups, which fought with one another. Jesus taught them that you must love your neighbours like yourself. His message of love, pity and brotherliness caused jealousy in the hearts of some people, and they got him sentenced to death. Even at the period of his death, his last words were- "God, please forgive these people. They do not realise what they are doing." Christmas is celebrated to remember Jesus Christ and his teachings. Christmas consider him to be the son of God. People pray in the churches, which are lighted up at night. Dramas relating to the life of Christ are played on the stage. People forget their old differences and embrace one another happily. 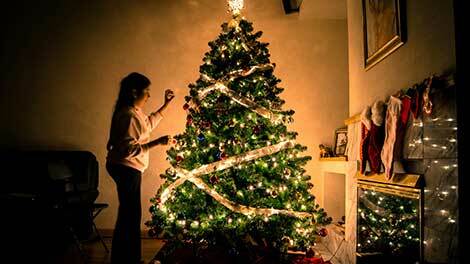 A Christmas tree is set up on the night before Christmas day and presents for children swing from its branches. The children regard them as presents from Father Christmas and accept them with great joy and respect. Christmas gives us a message of love, brotherhood and charity. The great sacrifice of Jesus Christ for the sake of others, give us with the message that we should always love our neighbours and the poor people and do good to them.